It's a great idea to do classroom-based research, but here are 7 caveats to bear in mind. How do you know what works in education technology? Here are details of 4 places you can go to on the web to find out. 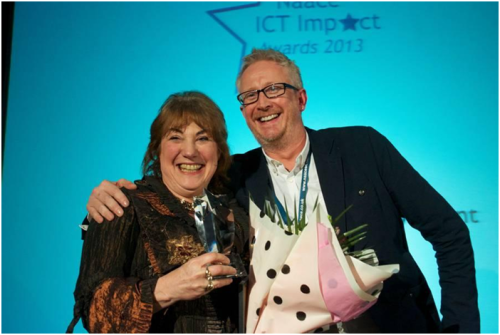 Christina Preston was one of two people given the Lifetime Achievement Award at the 2013 Conference of Naace, the subject association for ICT. I interviewed her to find out about her and her work. What’s the difference between action research, academic research and other types of research? Is it the case that in order to be seen to justify a research grant you have to couch your findings in terms which make them incomprehensible to the very people who might benefit from them? How does academic research “percolate” down into the classroom? And is there a case for saying that research findings should be reported in a “popular” style sometimes? How important is research for teachers in general, and ICT teachers in particular? One might be tempted to say that people learn in the same way now as they did thousands of years ago, so research, apart from keeping abreast of the latest developments in technology, is pretty redundant. I think there are problems with that attitude. If Games-Based Learning is something you’re interested in, or something you don’t know much about but would like to explore, you’ll be interested in these 3 events. The first one I’d like to mention is the Games-Based Learning Conference in London. This takes place on the 29th and 30th March, and I would say it’s essential to attend, for the following reasons. I think – and have always thought – that games have tremendous potential for education, as you can see from my case study. It’s great to have a conference dedicated to this subject. I attended the conference last year, and found it extremely stimulating. I met or attended sessions by people who are not on my radar at all. For example, I attended a short presentation by someone developing a so-called ‘serious game’ (I thought all games were serious; but what’s wrong with having fun anyway?) for a particular organisation at the time. As I had already arranged a visit by a group of teachers to the company to look at their IT systems, I was able to ask our host for a special detour to find out more about the simulations it had commissioned. I also attended one or two talks by academics, some of whom came from abroad. These talks brought an extra dimension to my understanding and knowledge of games-based learning. Like the Handheld Learning Conference, which is also organised by Graham Brown-Martin, the GBL Conference has a very vibrant, upbeat, celebratory atmosphere. At the end of the Handheld Learning Conference in October 2009 I scribbled one word on my notepad: ‘exhilarating’. The GBL Conference is similar. The organisers have been sensible enough to invite Derek Robertson of Scotland to give one of the talks. They’re doing brilliant things in Scotland – so much so that, having attended a Scotland-centred session at the Handheld Learning Conference, half of us were ready to emigrate there and then! To find out more about the conference programme and to register, go to the conference’s home page. And don’t forget: Early Bird registration ends on the 31st January. Computer games, learning and the curriculum: uneasy bedfellows? Unlike a conference, the atmosphere is a bit more intimate. I’m not talking about candlelit dinners intimate, but with a smallish number (around 20 or so) it’s easy to get to talk to most people there. The event is live-streamed, so we receive comments and questions via Twitter and through the FlashMeeting videoconferencing system. There’s a nice variety of speakers and attendees. This time, for example, Handheld Learning Award winner Dawn Halleybone will speak, as will Colin Harrison, Professor of Literacy Studies at the University of Nottingham, and Dominic Preston (Christina Preston’s son), who will talk about marketing issues. I will be chairing this event, and look forward to meeting you in person or seeing you online. To find out more about it, read the details, and register, online. The final ‘event’ is the publication of a special Games-Based Learning edition of Computers in Classrooms, my free e-newsletter. I have invited a number of guest writers to give their perspectives on games in education, and there will be reviews as well a prize draw for an award-winning game. Only subscribers will be entered into the draw, and as a subscription doesn’t cost any money, what are you waiting for? If you have experience of using educational games, or of games in an educational setting, or views, why not share them with your fellow travellers on this road to enlightenment? I can accept articles ranging from ultra short (140 characters), to almost ultra short (50 words) to average (600 words) to rather detailed (1500 words). But get in touch to pitch me your idea first! If discursive writing isn’t your thing, do have a look at my 50 Ways To Contribute To A Website. There’s sure to be something there to appeal to you!